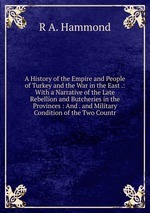 Аннотация к книге "A History of the Empire and People of Turkey and the War in the East . : With a Narrative of the Late Rebellion and Butcheries in the Provinces : And . and Military Condition of the Two Countr"